What Has Happened Before Will Happen Again! 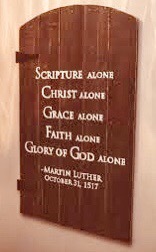 Today is the 500 year anniversary since Martin Luther nailed his “95 Theses” on the door of a church in Germany…ushering in the great reformation. According to Wikipedia the Reformation was a 16th-century movement for the reform of abuses in the Roman Catholic Church ending in the establishment of the Reformed and Protestant Churches. The action or process of reforming an institution or practice. May the Spirit of the Lord and the people of God, led by His Spirit, once again see another reformation ushered in. It will be a reformation of the heart that will reform practices that have created disunity and divisions. Though we do not fear what’s to happen, the enemy surely does and he’s been raging against it for many months now. Another great reformation is about to begin! May we be reformed from ways that have brought in abuses, divisions, works of the flesh, prejudices, judgements, jostling for positions, the sound of the resounding gong and steps directed by the head (man) and not the heart (God). May every place that our spirits have been joined with the spirit of the world be broken off of His Church by the grace of the Lord and by the work of His Spirit within us. May His love be nailed to the door of our hearts and to the doorway of this new era. May it reform us to a place of first love that does not fade away. This entry was tagged answers, Bible, breakthrough, Encouragement, firstlove, freedom, futureandhope, Grace, Hope, intimacy, Jesus, JOY, kathipelton, NOW, October 31st, prayer, Prophesy, propheticword, reformation, Supernatural, The Great Reformation, truth, unity, wisdom. Bookmark the permalink.